Global growth continues, but at an increasingly disappointing pace that leaves the world economy more exposed to negative risks. Growth has been too slow for too long. 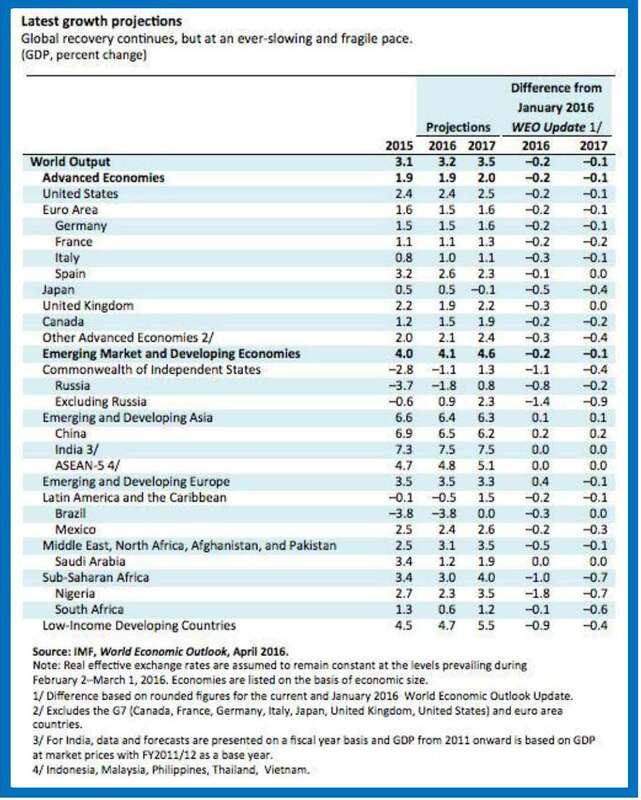 The new World Economic Outlook released today anticipates a slight acceleration in growth this year, from 3.1 to 3.2 percent, followed by 3.5 percent growth in 2017. Our projections, however, continue to be progressively less optimistic over time. The downgraded forecasts reflect a broad-based slowdown across all countries. That slowdown results from continuing trends that we have highlighted in earlier editions of theWorld Economic Outlook. As always, there is considerable diversity in performance within groups. The central scenario that the World Economic Outlook projects, however, now looks less likely compared with possible less favorable outcomes. Both to support global growth and to guard against downside risks to that baseline scenario, we propose a three-pronged policy approach based on monetary, fiscal and structural policies. Since last summer, we have seen two distinct rounds of global financial turbulence. They featured abrupt sell-offs of risky assets, heightened risk aversion, spikes in emerging-market sovereign spreads, and sharp falls in prices of oil and other commodities. Markets largely recovered both times, but investors have arguably reacted more than changing fundamentals would have warranted, both on the downswing and the upswing. There is a risk that further bouts of volatility feed through to the broader economy. As the new Global Financial Stability Reportdocuments, these financial swings overlie a steady trend of global financial tightening. The factors behind it include increasing net capital outflows from emerging markets. While most have managed to cope with these so far, as this World Economic Outlook discusses, more strains could begin to appear. Continuing violent instability in a number of countries, notably Syria, continues to crater their economies, driving millions of refugees to surrounding countries as well as to Europe. This is a humanitarian disaster. It has challenged the European Union’s capacity to preserve open internal borders, and as the incidence of terrorism has increased, the strains have only grown. Coupled with other economic pressures, the result in Europe has been a rising tide of inward-looking nationalism. One manifestation is the real possibility that the United Kingdom exits the European Union, damaging a wide range of trade and investment relationships At the same time, across Europe, the political consensus that once propelled the European project is fraying. In other advanced countries as in Europe, including in the United States, a backlash against cross-border economic integration threatens to halt or even reverse the postwar trend of ever more open trade. And unfortunately, there is more. Several large emerging market economies face deep contractions due to internal political strife or geopolitical pressures, and a number of low-income and emerging market countries suffer El Niño-related drought or flooding. The costs could escalate. The weaker is growth, the greater the chance that the preceding risks, if some materialize, pull the world economy below stalling speed, where demand is insufficient to avoid a low-growth, deflationary equilibrium that some economists have characterized as secular stagnation. In many countries, lack of wage growth and greater inequality have created a widespread sense that economic growth has benefited mobile elites and owners of capital disproportionately, leaving too many others behind. Lower growth reinforces the turn toward inward-looking and nationalistic policies. In brief: lower growth means less room for error. We are not presently in a crisis. As IMF Managing Director Christine Lagarde has put it, our state is one of alert, not alarm. In this environment, policymakers should focus on two tasks. The first task is to strengthen the baseline outcome by strengthening growth. This is valuable in itself, of course, but also gives important insurance against downside risks. The second task is to make contingency plans for a possible future in which downside risks nonetheless materialize. For both tasks, effective policy requires a three-pronged approach. Continued monetary accommodation is appropriate where deflationary pressures—which are dangerous in themselves—and negative output gaps remain. But monetary policy needs support from the two other policy prongs, fiscal and structural policies. For a number of countries, infrastructure investment looks attractive—both from a short- and a long-term perspective—at the currently low real borrowing rates their governments face. Fiscal support of research and development could have a notably rich payoff, as the latest Fiscal Monitor shows. Balanced budget tax reforms can move fiscal policy in more growth-friendly directions, while also better supporting aggregate demand, labor force participation, and social cohesion. As this latest World Economic Outlook explains, a range of well-sequenced structural reforms can boost potential output, especially if accompanied by complementary fiscal support. Pro-competitive product market reforms in particular, such as those implemented with considerable success in Canada, the Netherlands, and Spain two decades ago, and in Italy in the 2000s, can be expansionary in the near term. Finally, further financial sector strengthening, as detailed in the Global Financial Stability Report, is essential to create a context in which monetary, fiscal, and structural policies can be more effective. But policymakers should not ignore the need to prepare for possible adverse outcomes. They should identify mutually reinforcing fiscal and structural policy packages to deploy collectively in the future in case downside risks materialize. In addition, continuing international cooperation to improve both the functioning of the international monetary system and the stability of international finance are vital for global economic resilience. That work has progressed considerably since the global financial crisis, but there is more to be done. With its downside possibilities, the current diminished outlook calls for an immediate, proactive response. To repeat: there is no longer much room for error. But by clearly recognizing the risks they jointly face and acting together to prepare for them, national policymakers can bolster confidence, support growth, and guard more effectively against the risk of a derailed recovery. Read also WEO summary story and watch interview.